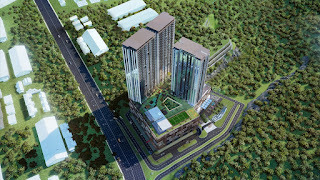 Liberty Arc @ Ampang Ukay is the first phase development of Ampang Ukay by EcoFirst. Liberty Arc @ Ampang Ukay consists of three towers (Tower A, B and C) and has a total of 1,632 Small-office Home-office (SoHo) units and 32 retail units. The built-up size for the SoHo units is 450 sq ft, with the minimum selling price from RM300,000 or an average of RM750 psf.